This 2015 Silver American Eagle Coin was minted in West Point, New York and was certified Mint-State 69 by the PCGS. Each coin is also part of the US Mint’s first strike batch which includes only coins minted within the first 30 days of production for the minting year. First Strike labels designate that the coins were received by PCGS within the first 30 days of the coin’s release. Silver American Eagles are in high demand every year. Noted for stunning designs and impressive quality, numismatists clamor for the coins year after year. The United States Mint strikes Silver American Eagles based upon the demand for the coins, with total mintage often climbing well into the millions on an annual basis. Minted by the United States Mint at the West Point facility. Graded a near-perfect MS69 by the PCGS. The Silver American Eagle is the official silver bullion coin of the United States. The first coins were struck in 1986. Mintage reached an all-time high in 2014, with an estimated 44 million coins sold. 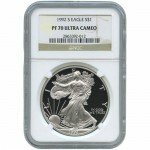 These 2015 1 oz Silver American Eagles continue that stunning tradition. Each of these Silver American Eagles has an MS69 grade from the PCGS. A coin with a Mint State 69 grade has a very attractive, sharp strike on the date and mint marks. The coin still maintains its full, original luster and has no more than two non-detracting blemishes. There are no hairlines or scuff marks visible on these Silver American Eagles. Coins issued as part of the First Strike series were struck during the first 30 days of production, arriving at the depository soon after. These Silver American Eagles have the same design as all coins in the series. Adolph A. Weinman’s Walking Liberty is depicted on the obverse side of the coin. Weinman, an artist and sculptor, studied under Augustus Saint-Gaudens, who is considered the best coin designer in American history. John Mercanti, the US Mint’s chief engraver, designed the image used on the reverse side of the coin. His heraldic eagle features a unique 13-star design above the eagle and shield, representing America’s original colonies. The United States Mint is considered one of the finest facilities in the world. Unlike most other mint systems around the globe, the US Mint operates several different facilities. In total, the San Francisco Mint, Denver Mint, Philadelphia Mint, and West Point Mint produce coins for the federal government. 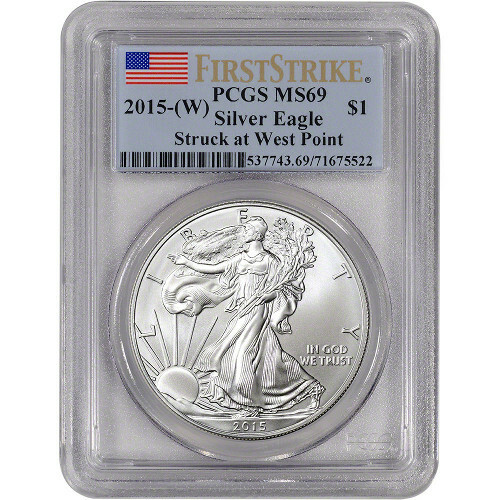 If you would like to learn more about our 2015 West Point Silver Eagles PCGS MS69 (First Strike) or have any questions before placing your order online, feel free to call a Silver.com associate at 1-888-989-7223 or online through our live chat feature.